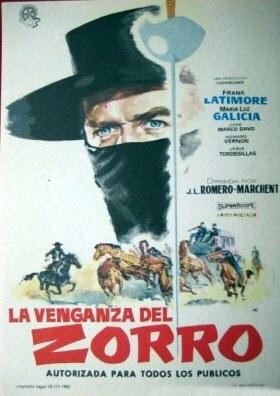 During the 1960s, over thirty foreign Zorro movies were produced, chiefly in Mexico, Italy, and Spain. Inexpensively shot, they would be classified in the genre of "spaghetti westerns." McCulley's masked fox confronted Cardinal Richelieu with the Musketeers in ZORRO E I TRE MOSCHIETTIERI (ZORRO AND THE THREE MOUSKETEERS, 1961, Italy). Zorro returned the grand duchy of Lusitania to its rightful heir in ZORRO ALLA CORTE DI SPAGNIA (ZORRO IN THE COURT OF SPAIN, 1962, Italy). He became King of Nogara in ZORRO CONTRO MACISTE (ZORRO AGAINST MACISTE, 1963, Italy). In ZORRO ALLA CORTE D'INGHILTERRA (ZORRO IN THE COURT OF ENGLAND, 1969, Italy) Zorro opposed a tyrant who ruled an English colony in Central America for Queen Victoria. ZORRO, MARCHESE DI NAVARRO (ZORRO, MARQUIS OF NAVARRO, 1969, Italy) found the masked hero opposing Napoleon's troops in Spain at the beginning of the 1800s. An extra named Sophia Ciccaloni who appeared in IL SOGNO DI ZORRO (ZORRO'S DREAM, 1962, Italy) went on to a renowned film career as Sophia Loren. Another 1962 Italian film, IL SEGNO DI ZORRO (THE SIGN OF ZORRO) launched the acting career of Sean Flynn, the son of romantic swashbuckler Errol Flynn. The fox didn't wear his characteristic black outfit and carve a Z on a wall only once. Directed by journeyman Mario Caiano, the remake was lackluster and forgettable. The most notable of these foreign productions starred French actor Alain Delon. As with other productions, Delon's 1974 film takes great liberty in place and story, yet preserves the basic elements of McCulley's character. Here's some interesting stuff... "Zorro returned the grand duchy of Lusitania to its rightful heir in ZORRO ALLA CORTE DI SPAGNIA" ... Lusitania is actually mainly what is now Portugal, not Spain! I really must see this flick! The Alain Delon Zorro has one of the best sword fights in cinematic history. You can skip the talking parrot but don't miss the sword fight at the end of the movie. Os Europeus fizeram realmente muita coisa boa para o cinema. Seus filmes Épicos de Fantasia (Sansão - Hercules - Maciste - Gladiadores e de Capa e Espada, etc) tiveram seu momento também e são muito cultuados ainda hoje por colecionadores assim como o Western Spaghetti no mundo inteiro. My name is Phil Latter and my email address is chromium_foil@yahoo.ca Why 'chromium foil' ? Translate that as 'silver sword'...of Zorro! I've been collecting all artifacts/collectibles/memorandum of my # 1 favourite fictional character, Zorro, for over 40 years! Toys,films (especially rare foreign films, of which I still need many! ),figures,games,etc,etc,etc for over 40+ years! Always interested in speaking to other Zorro fans and collectors, & looking to buy Zorro artifacts! Email me!